PETER FLINT (composer, pianist, accordionist, and director of The Avian Orchestra) comes from a musical family. His grandmother was an organist and piano teacher, and his mother, harpsichordist Karen Flint, leads Delaware’s Brandywine Baroque Ensemble. He received degrees from Oberlin College and Conservatory of Music and New England Conservatory. 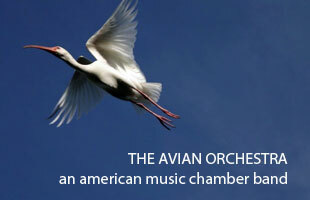 In 2002, he founded The Avian Orchestra in New York City to provide opportunities for emerging American composers. Of late, he has shocked and/or delighted his friends and acquaintances (depending on to whom you speak) by taking up the accordion and, with a clarinetist and a cellist, formed a trio for which he is writing a series of etudes and scheduling performances. Other recent compositions include Bait and Switch 2011, a complete revision of a decade old piece for two cellos, re-premiered recently in NYC; Ascending Tendrils, a commission for the Baroque quintet, Melomanie; Double Speaking for flute and guitar; Freewheels, a chamber piece with bicycle-part percussion and video; and MicroConcerto:Spontaneous Combustion for improvising piano and string quartet. His music has been performed regionally by The Avian Orchestra, American Opera Projects, the Serafin Quartet, the Orchestra of the SEM Ensemble, Dinosaur Annex, Brandywine Baroque, Melomanie, and the Auros Group for New Music, among others. Upcoming projects in 2011 and beyond include a new program of music about plants for The Avian Orchestra; a song cycle of reinterpreted fairy tales; an internet opera/oratorio about the abolitionist John Brown; as well as new music and performances with an accordion ensemble he is forming with other squeezebox-playing composer colleagues. When not busy with all this and his family, he plays soccer, tinkers with vintage bicycles, and occasionally brews a batch of homemade beer. This entry was posted on Tuesday, August 30th, 2011 at 8:59 pm. It is filed under Composers, Upcoming Composers.